I’m always on the lookout for moisture related stories. Part of this is about testing my own knowledge and asking myself if I can make sense of the story. Last week I was following stuff on Twitter seeing if anything caught my eye. Suddenly out jumps what I would call a little gem of a story. Actually it was not a story as such but a research paper that had just been published. However, the content was very much part of my story in My World of Moisture …. You may be wondering why I’ve shown a picture of an insect. This little creature has been used in scientific research into genetics for many years. When working on my PhD in the Molecular Biology Department at Edinburgh University, there was a group working with this insect. Its Latin name is Drosophila melanogaster. Commonly known as the fruit fly or vinegar fly. We’ve just had hundreds of these harmless little flies in our compost bin because of the recent warmer weather. Just a side story before I get back to Drosophila’s part in My World of Moisture. Being a flying insect you don’t really want to have these swarming around your research department. So a wingless fruit fly was developed to make it easier to handle them when studying their genetics. During the time I was at Edinburgh University I set up a tropical fish tank at home. 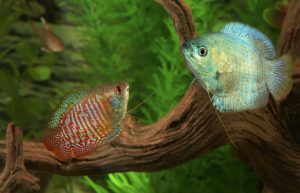 Regularly I would take some wingless fruit flies home to feed to my fish. Anybody who has kept fish knows that they absolutely go mad for live food. In my teens I kept tropical fish for years and would go into the local woods to a pond and catch Daphnia. This is a little planktonic crustacean that fish love to eat. Often, unintentionally, I’d catch at the same time, mosquito larvae, which hang upside down at the surface of water and my fish would pick those off too. Unfortunately the odd mosquito larva, or two, or three…. would turn into mosquitoes. My mum wasn’t happy, I say no more. Getting back to Drosophila melanogaster. A group of scientists located In Sweden and the USA are working on the way insects respond to their environment. Similar to us reacting if we feel hot or cold through our senses, every other living organism has some way of detecting if their surroundings change. From bacteria and other single cell organisms and all the way up the animal kingdom to us there are special structures on cells that react to a change in our environment, temperature for example. In a research paper just published by the above group working with Drosophila, they report finding a structure on the antenna of the fly that allows it to react to changing humidity. When you are only 2mm in size and moisture is a big part of your existence then it makes perfect sense to havesome way of telling in which direction moisture can be found. Reacting to moisture changes and sensitivity to humidity is seen in other insects. I wrote about this ability in honey bees. A very subtle and complicated way of using moisture is exploited by house mites, and I included a chapter on this in my eBook. 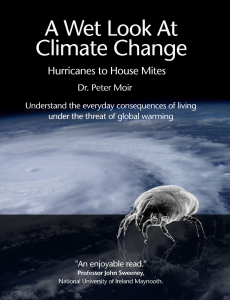 I was so impressed by this ability of the house mite, they deserved to be included in the subtitle “Hurricanes To House Mites” of my eBook. My intention is to point to the diversity and importance of the role of moisture in nature. 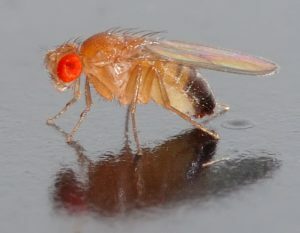 ow have they found the structure that communicates with Drosophila’s nervous system giving it the “sense” of humidity. We humans don’t have this ability. In fact we are very poor at knowing what the relative humidity of our environment might be at any time. It is only at high temperature and high humidity that we say “it’s humid weather”. Our sense of the air being “humid” comes from heat carried by moisture in the air and our skin senses this heat. If we did not respond to this sense of heat in very humid conditions we would be in danger of overheating, and that can be lethal. So why at the beginning did I say “a little gem of a story”? My joy of discovering the Drosophila research paper comes from that I totally expected this to happen. For several years I’ve known about the sophisticated mechanism behind how house mites get their water from the air. To have in Drosophila a structure on its antenna sensitive to moisture seems to me to be a much simpler mechanism to have evolved over the millions of years insects have been around. I would think it is a good bet that similar humidity sensing structures will be found in other insects.